For main brittle materials the elastic properties as like elastic limit, modulus of elasticity, yield strength and modulus of resilience are similar in compression and tension. The eventual or ultimate compressive strength of most brittle materials is not same than the final tensile strength. For illustration, in concrete, the eventual compressive strength is about ten times its ultimate or eventual tensile strength. The compression test piece or specimen fractures because of shearing along a plane inclined to the axis following figure. 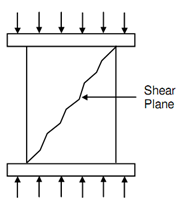 The orientation of the plane of shear is affected via the attendance of normal compressive stresses and the last fracture does not often arise along plane of maximum shearing stress that is inclined at an angle of 45o along by the axis. The orientations of shear of plane vary among 35o and 45o along with the axis. Still in brittle materials some lateral bulging will tend to happen. Such lateral deformation is greatly controlled at flat specimen ends because of friction between the specimen ends and the platens. This friction decreases for longer specimen. Whether the compression specimen is longer, it might have a tendency to buckle. To minimize the influences of buckling and friction the length to diameter ratio of compression test piece or specimen has to be selected extremely careful. 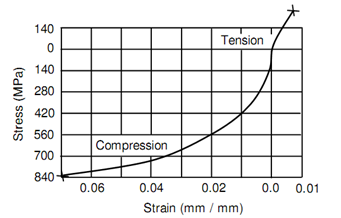 For determination of compression strength such ratio is in between three and two. Conversely, for determination of elastic properties the ratio of length to diameter might be chosen among eight and ten. Whether this ratio is less than 1.5 the fracture plane might intersect the end that is undesirable. It may be noticed that the brittle material whether the atomic bonds are not re-established will ultimately fracture because of slip that may happens along one or several planes. The fragmentation is later failure. Whilst the cracks, holes and pores play very significant role in reducing tensile strength the similar do not become active beneath compressive stress. They quite close and net compressive strength is higher than tensile strength mostly in case of brittle materials. Following figure shows this fact fore cast iron and Table no.2 describes the similar for various materials. Notice: Concrete 1.3 mixes by volume, water cement ratio 0.64 (via volume) cured for 28 days. Compression test is terminated whether excessive deformation happens and specimen does not fracture. The hydrostatic compression is the loading whether all elements are subjected to equal compression stresses in every three directions. Such state of stress which is accessible while a body is submerged in water does not reason any distortion but generates only volume reduction. In that a test the specimen may not fail at all since at atomic level that condition or state of stress will tend to push atoms in each other and no slip would happen, thus no plastic deformation.